What can I do About 'Teeth Grinding'? Did you know that approximately one in three people clench or grind their teeth? That’s a huge percentage of the population and it seems that it’s even more common in young children. So what’s the big deal? Well, the process sets up significant stresses on your teeth, your restorations, your muscles and your jaws, and whilst you may be aware of symptoms- such as an aching jaw, restless sleep or headaches- you may not be aware of the cause. Grinding is largely an unconscious activity: usually taking place whilst you are sleeping – damage can be occurring without your knowledge. Grinding can also of course occur during the day, but either way, your dentist will usually pick it up during a routine dental examination. What is a parafunctional habit exactly? A parafunctional habit is used to describe abnormal behaviour of the teeth, tongue, mouth and any associated muscles. Bruxism or grinding, and clenching of the teeth are included in this category – but so too are things such as lip or fingernail biting, pen chewing, or any other regular habit that is not associated with eating, drinking and speaking! Attrition is another dental word you might hear in regard to ‘tooth wear’. It simply means wear from tooth to tooth contact- and so a dentist may say, ‘There has been attrition of the teeth due to bruxism,’ for example. It is the process of squeezing your teeth firmly together (clenching) and then rocking or sliding them backwards and forwards across each other (grinding). The two habits often go hand in hand and these movements put excessive pressure on your teeth, muscles, jaws and the jaw joint itself. How do I know if I am grinding? If you are grinding your teeth, you may be aware of it and experience some of the signs and symptoms described below. However, most people are unaware that they grinding, and it is usually left to the dentist to pick it up. Some people wake themselves up with grinding, or wake their partners with the noise. It’s remarkable how much noise can be generated from the process! In general, symptoms tend to be worse in the morning because patients have been grinding through the night. If you already have, or now notice any of the following symptoms, it’s important to get a dentist’s opinion. Not only is the quality of your sleep and rest being affected, which will have knock on effect, not just day-to-day, but throughout your life, but quality sleep is correlated to all sorts of stress related disorders and even life expectancy. In terms of your teeth, it can take a long time (years) to show noticeable wear, but the damage is irreversible and the methods for replacing and restoring it become more extensive and expensive the greater the damage. Prevention is most certainly better than cure here. How does the dentist diagnose a grinding habit? If we take the signs above a step further and actually go inside your mouth, there are a number of characteristic changes that occur when someone has a bruxing habit. Dr Jamie will ask you a number of questions: check your dental history and ascertain whether any of the symptoms above are present. He will look at the muscles that activate in your mouth, and test them for tenderness, and assess them for hypertrophy or enlargement, which may be due to excessive use. This is very common in the Asian population (particularly females), as they tend to have larger masseter muscles. He will then look at the soft tissues of the tongue and cheek for Indentations, or a white line of keratosis caused by the repeated friction of the process. • Your teeth all look the same height in your smile; there is no difference in length between the lateral incisors and the central incisors. • When you slide your teeth across one another (to the side and to the front), they all stay in contact with each other. • The patterns on the teeth are flattened and have lost their cusps and anatomy. • The enamel of the teeth has thinned and the dentine is more visible. • You have multiple or frequent chips and fractures of both your teeth and fillings. • The muscles involved in moving your jaws (that is the masseter, pterygoid muscles and the temporalis) are tender or even slightly enlarged – a process known as hypertrophy. One great way to observe the damaging and long- term effects of grinding is to look at baby- teeth. Since they are softer and thinner, their enamel wears more quickly, particularly when they are getting close to dropping out. At this point their teeth will have shortened considerably… rather like those very old people who have lived with a grinding habit throughout their whole lives. 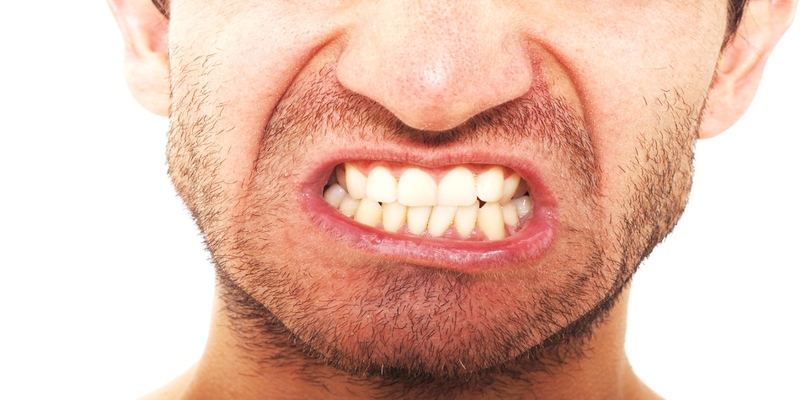 So what causes bruxism or grinding? • Stress- this is a big one! Slowly progressing chronic conditions cause slow incremental damage over a long period of time. If you have grinding symptoms, then you should seek treatment, but for those of you who don’t, things may slip under the radar and considerable damage can occur before you take action. The cusps and mountainous shape of your molar teeth are designed to help chew your food; they will flatten over time. Front teeth will wear too, eventually leading to an ‘edge to edge’ bite which visually means they look the same level and straight across. If grinding is left to simply progress, the enamel will deteriorate thus exposing the dentine, which because it is softer will wear much more quickly and ultimately the nerve may be affected. The more height that is lost, the more your facial height will change: wrinkles around your mouth together with drooping of the corners will occur. How is bruxism (grinding) treated? 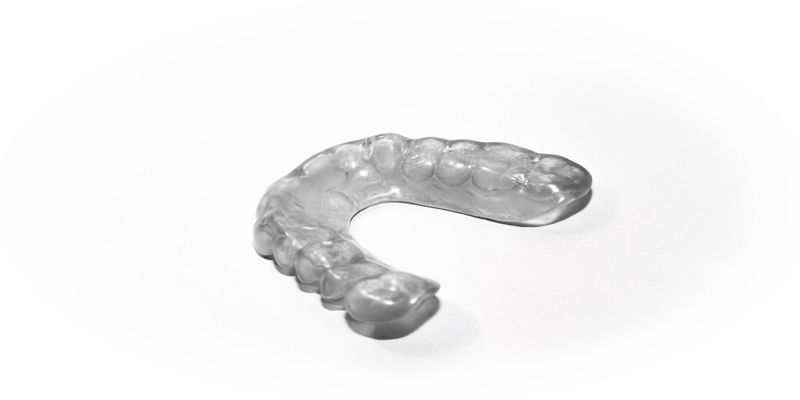 The most common treatment to prevent further tooth wear and loss of enamel is a grind guard, occlusal splint, night splint or a night guard All phrases for the same thing- a protective custom made guard that you wear at night to protect your teeth. It is important the bite is correct and even, so as to maximise the protection offered. You may still grind wearing the splint, however your teeth will be protected as the jaw space between the joint will be opened up thus helping to relax the muscles. If you are grinding in combination with sleep apnoea, a mandibular advancement device may be needed to help open the airway. This custom orthotic is worn on both the top and bottom teeth, not just on the top like an occlusal splint, and will protect your teeth. If left untreated, and you begin to lose significant height and experience sensitivity; you may need full mouth rehabilitation with bonding and crowns in order to restore your mouth to its former glory. The bite will need to be opened up in order to do this and create space for the restorations. This is one circumstance where prevention is definitely better than cure. • If you grind or clench your teeth when focusing during the day, then becoming aware of the habit is key to kicking it. Should I be worried that my child is grinding his teeth? Teeth grinding in children is actually very common. We don’t treat it in children as a lot of them simply grow out of the habit, especially when their adult teeth start to come through. Once all the adult teeth are fully through and in position (e.g. after braces), then if the habit is continuing, preventative treatment will be needed to prevent long-term damage.